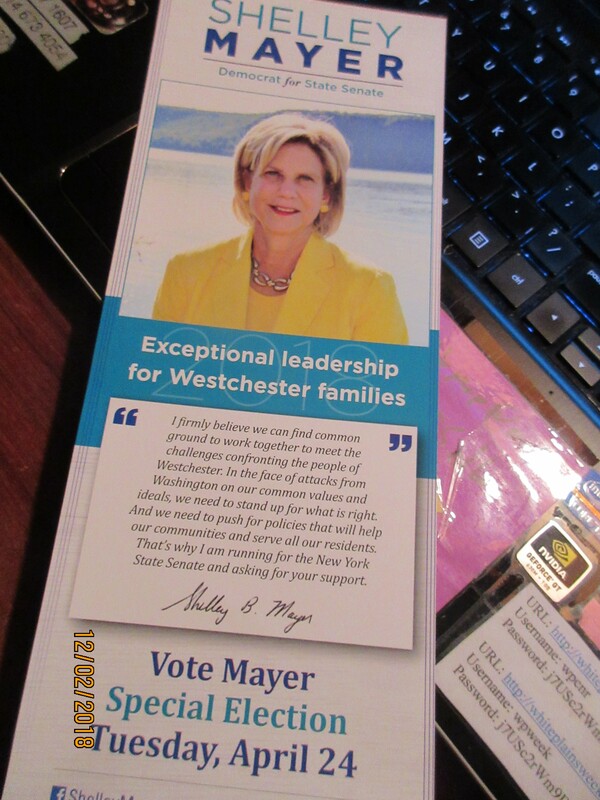 Canvassers for Shelley Mayer, Democratic Nominated candidate for the State Senate Seat , District 37, were passing out fliers today in White Plains, to tell voters that the Governor set April 24 for the Special Election, in which Ms. Mayer will face Republican opponent Julie Killian. Ms. Killian’s former campaign manager, William F. B. O’Reilly confirmed this morning that Dan Schor withdrew his name for consideration. O’Reilly advised WPCNR that Mike Lawler is Ms. Killian’s Campaign Manager. The canvasser WPCNR spoke to said the Governor had set the date 2 or 3 days ago. However no news release was sent out by either party locally or from the Governor’s office.